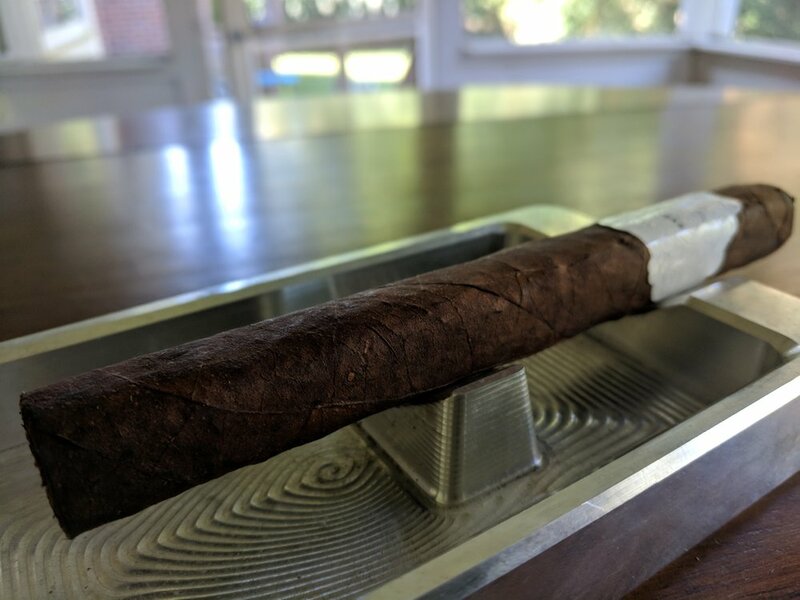 Review of one of Warped’s (and 2018’s) most anticipated cigars! This band is very nicely done. You can sense the influence from Matt Booth’s jewelry background as this looks like a ring you might find in a showcase. 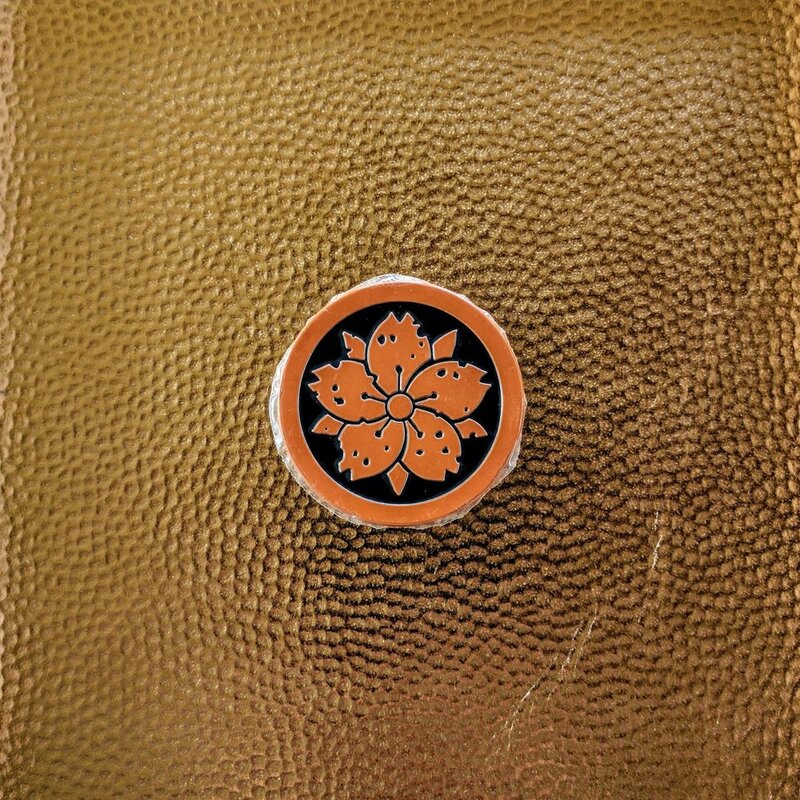 The plain copper text is matched by Room101’s floral logo on the opposite side and complimented by a copper secondary band. The band, of course, closely relates to the boxes – which helps to unify the line. All in all, I like the band design – feels simple yet someone has taken the time to develop and refine it. I’ll say the construction definitely looks high-end – gorgeous light brown wrapper smooth with some prominent veining. A little closer inspection reveals some raised seams however, which betrays the high-end initial look. Maybe it’s just this cigar? Everything else about it feels classy. The perfecto cap is well-constructed and matched by a beautiful perfecto-style foot. 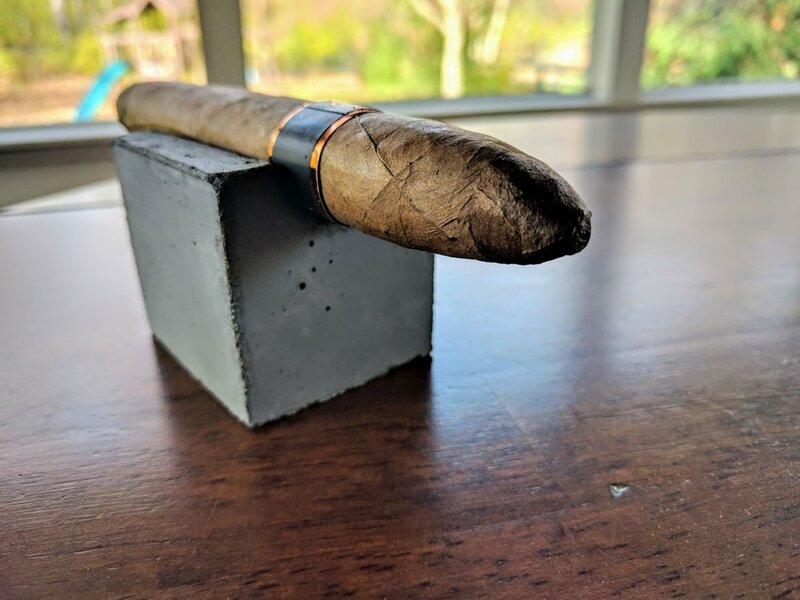 The body of the cigar feels very loose and has a lot of give. They’ve been stored at 67-68% humidity and right around 70 degrees – so I’m pretty sure it’s not how the cigars were stored. I’ll be curious to read if others have found this as well. Barnyard smell is very prominent. Some rich earthy, peaty notes with boggy overtone. Cold draw reinforces the barnyard aroma with some decent citrus zest – and sugary – almost like limeade. There is a definite lemon custard taste. 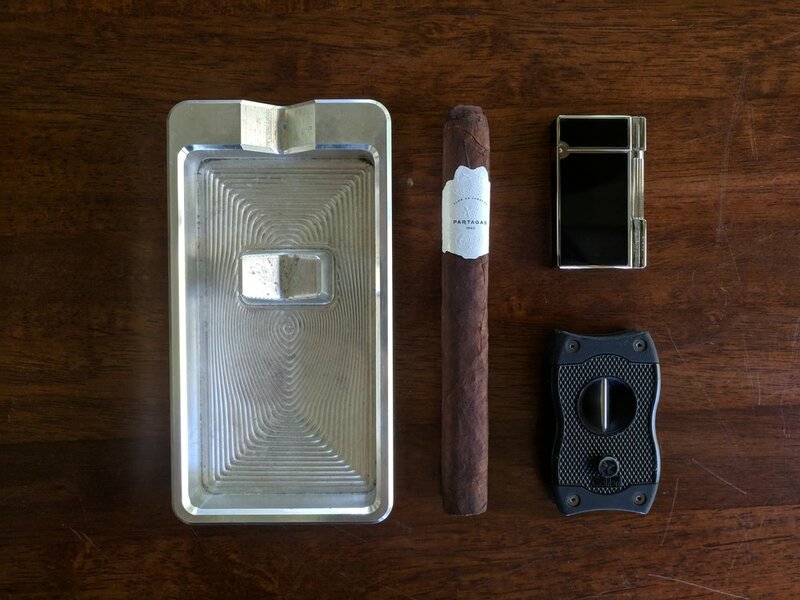 Very nice open draw without feeling too open – surprising given the feel of the cigar. Snip the tip, toast and fire it up with my single torch lighter. The sweetness is immediately gone and replaced by woody, nutty tones – and honestly, even these are very muted. The initial few puffs are disappointingly bland and not really indicative to the pre-light aroma or draw. Smoke is quite plentiful. As most perfecto vitolas do, it started out tame and has now built to nice voluminous billows of beautiful white smoke on each puff. 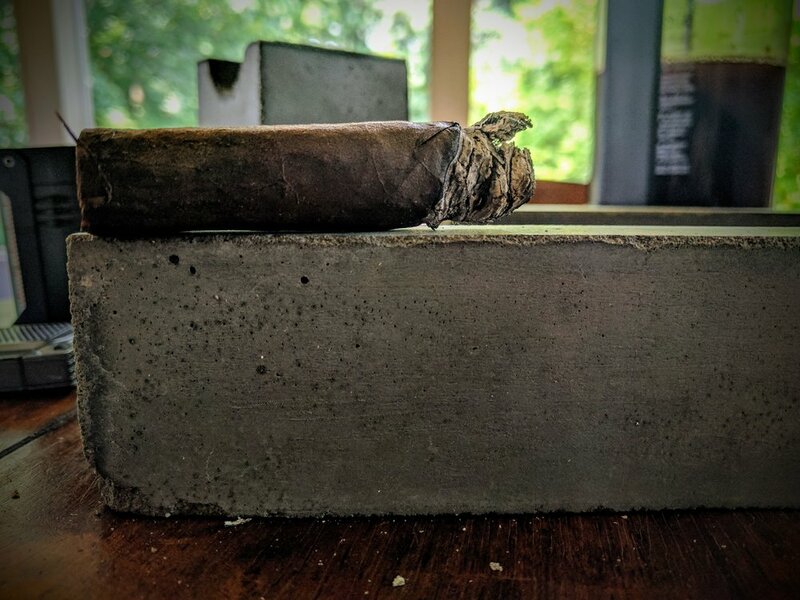 As it progresses into the early stages of the cigar, the light citrusy notes are slowly returning and complimenting the wood/nut notes. The ash is layering and stacking nicely. Burn line below the chalky white ash is very clean and even. Lemony profiles still softly govern the flavor of this cigar. There are also some harder to detect things happening – maybe a little chai tea latte – there’s a spicy, creamy sweetness to it – nothing prominent, more like a subtle backdrop to the lemon sweetness. Some of the barnyard is starting to come back just slightly. Some unfortunately timed ashing. The lemon and sweet flavors are basically gone. The cigar has moved to more light pepper and hay flavors. There are also still some tea tones – maybe something along the lines of a traditional Earl Grey – the creamy nature of a latte seems to have faded. Also noticing some lingering vanilla on the finish. Burn line got a little unruly but some minor maintenance and it’s right back to being crisp and clean. 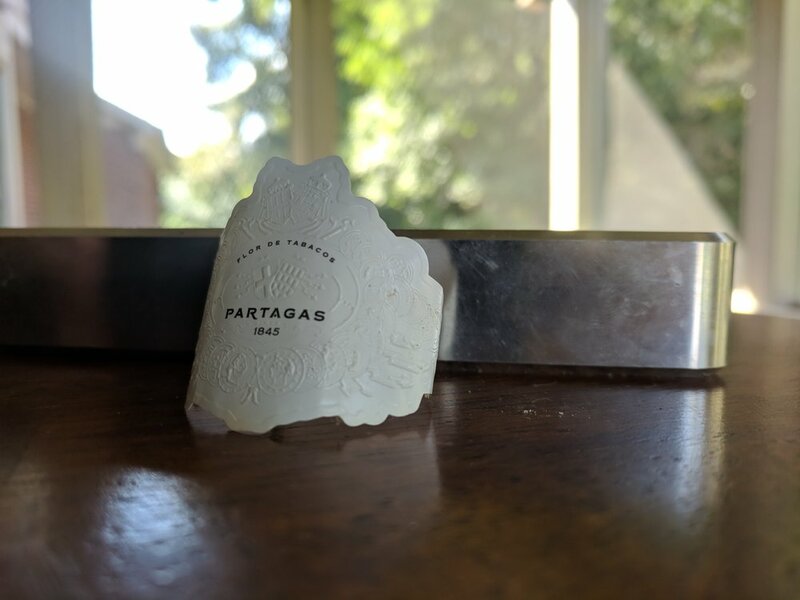 This smoke, while enjoyable, is a little schizophrenic – it has some very interesting flavor profiles but instead of them progressing in an expected manner, they seem to come and go sporadically throughout the smoke. Certainly starts on the sweeter side and moves on to be a little more peppery at the end. 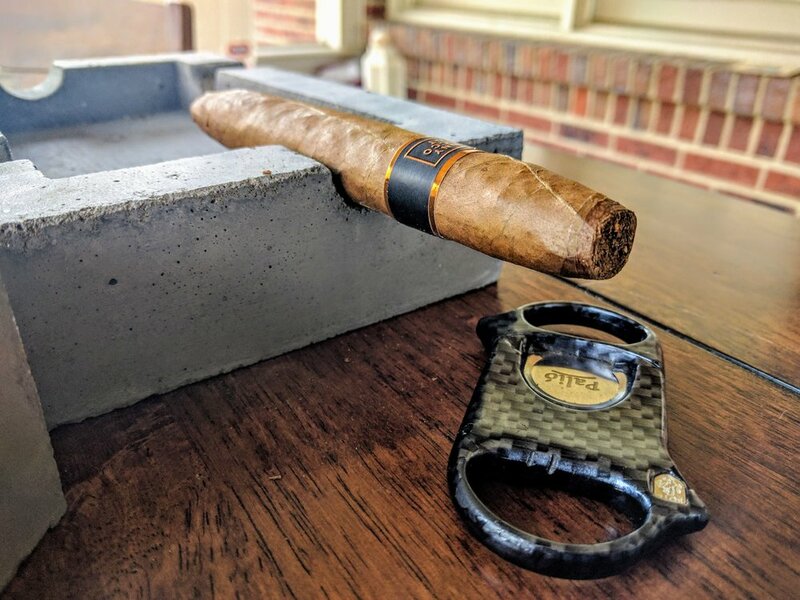 A medium smoke that is a great uncomplicated cigar perfect for smoking at a tailgate or BBQ, where you want a cigar in your hand but aren’t necessarily concentrating on the flavor nuances. 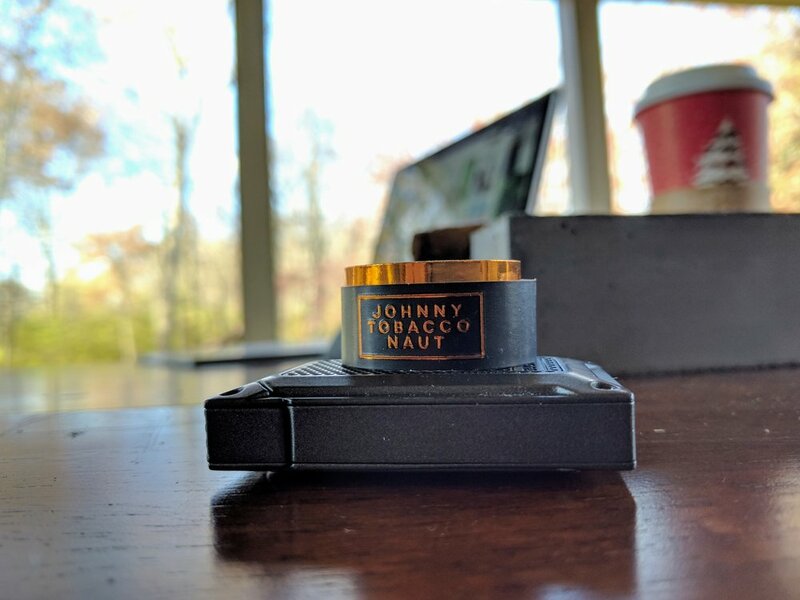 Other reviews for the Johnny Tobacconaut line are all over the place! Some people love it and had perfectly constructed sticks! 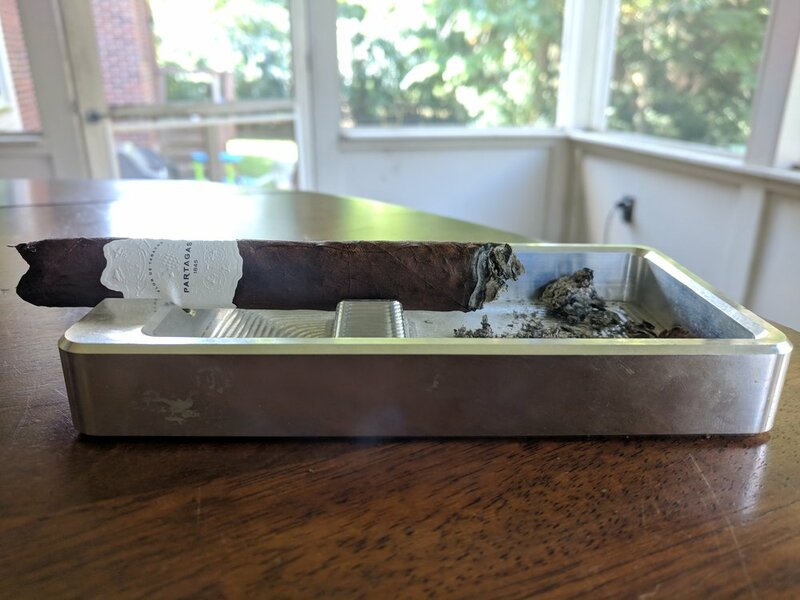 Other reviewers had horribly made cigars that were borderline unsmokeable! It really is crazy how much the quality of this particular line seems to vary – especially given the limited release nature of it. 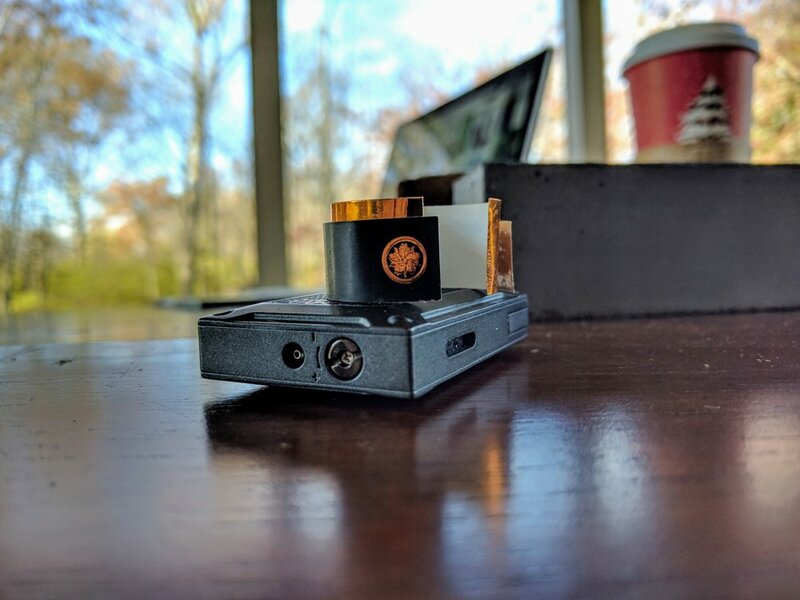 It just goes to show, reviews can be unreliable – make sure you’re smoking and rating cigars for yourself – not eliminating them from your options based on some bad reviews! Or, for that matter, buying them solely on good reviews! 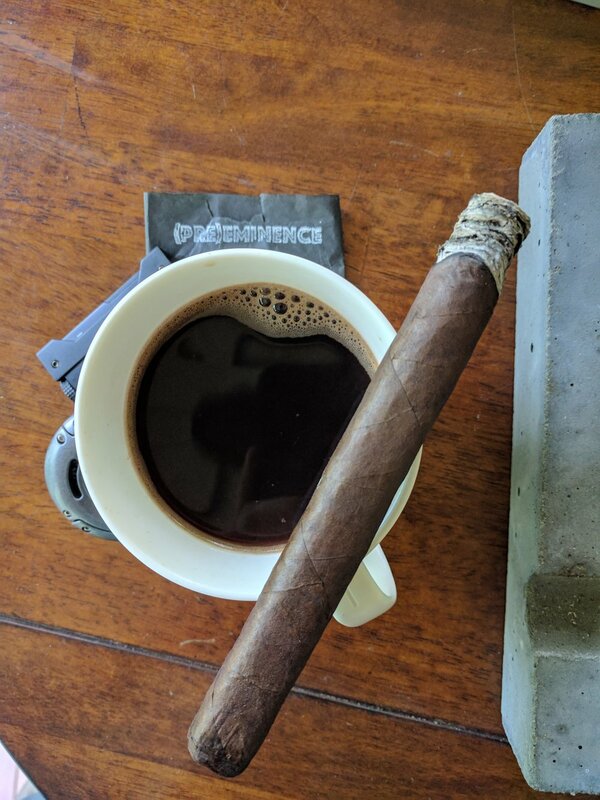 The boys at Ezra Zion created (Pre)Eminence as a complimentary cigar to be paired with their Eminence coffee - while I didn't pair it with that specifically, I did enjoy it with some coffee this morning. The cigar is based on Ezra Zion's Eminence - which earned a 94.5 rating (not sure where, but they tout it). The priming is different but the blend is the same. 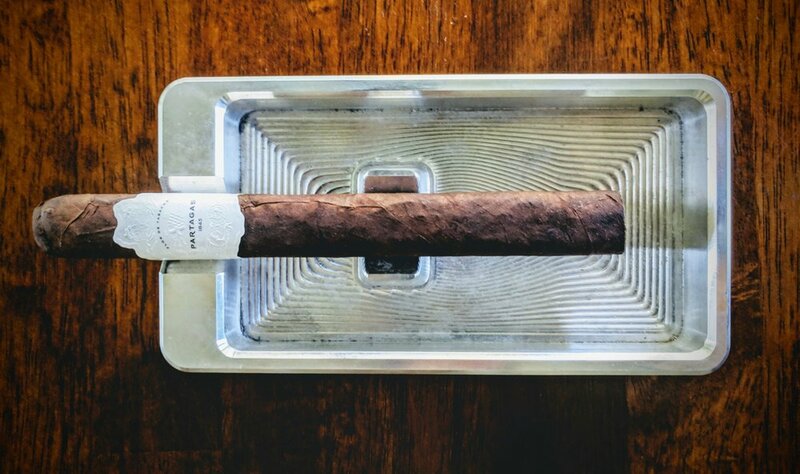 There's usually very limited info regarding Ezra Zion's limited-run cigars but there is even less out there for the (Pre)Eminence. No reviews, no info outside of a few sentences on their site. 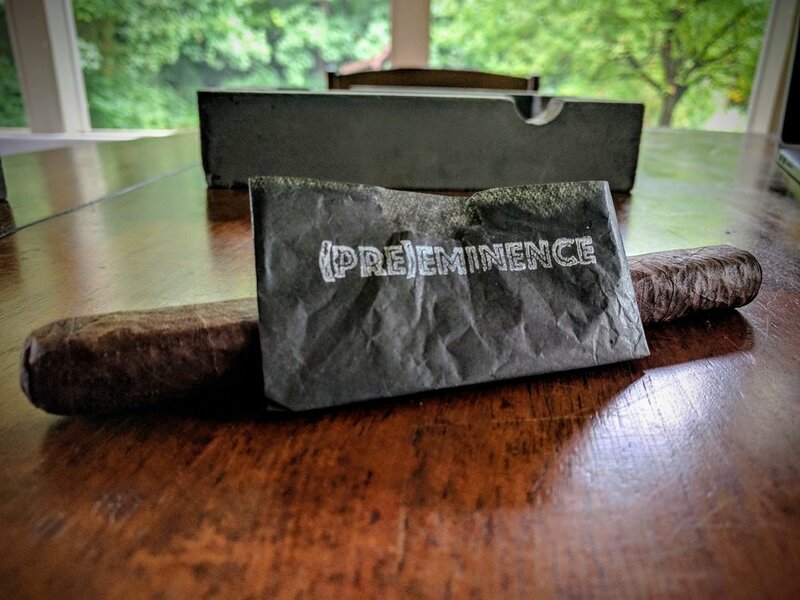 The (Pre)Eminence comes wrapped like a Tootsie Roll. It does not have a traditional band near the cap. 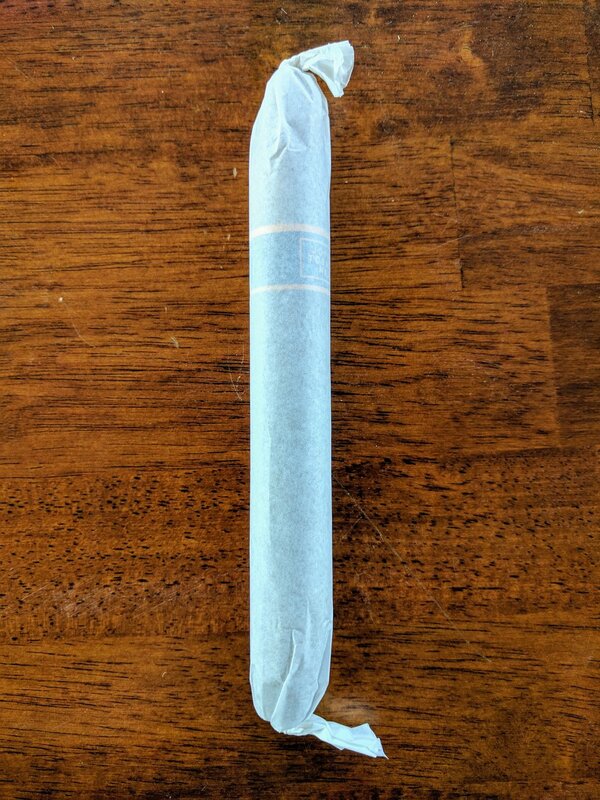 Once unrolled from the full-length tissue-like paper it's naked. 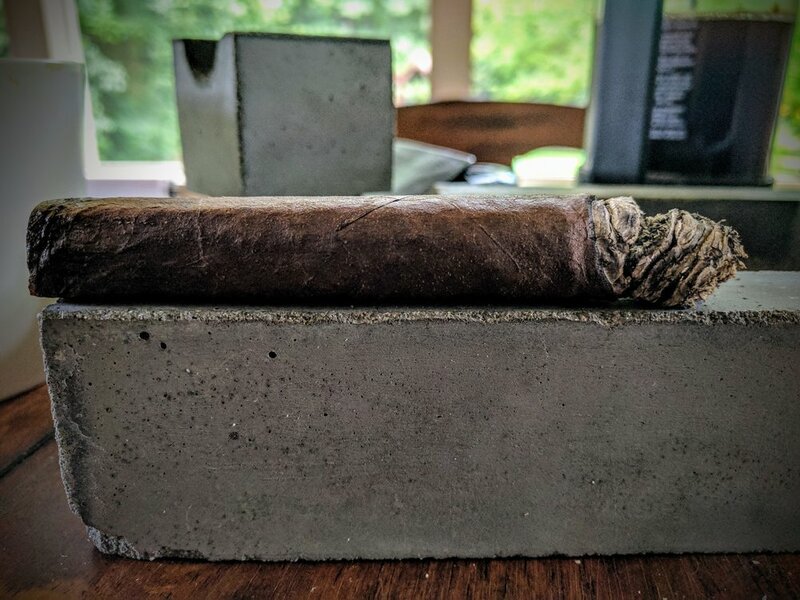 Personally, I really like the full-body wrapping however it makes me a little paranoid not being able to see the cigar as it ages in my humidor. Right or wrong, I feel like these - along with tubes, coffins, cedar, etc - tend to foster mold growth. Either way, I do enjoy the matte black paper with the chalky white text identifying the cigar. 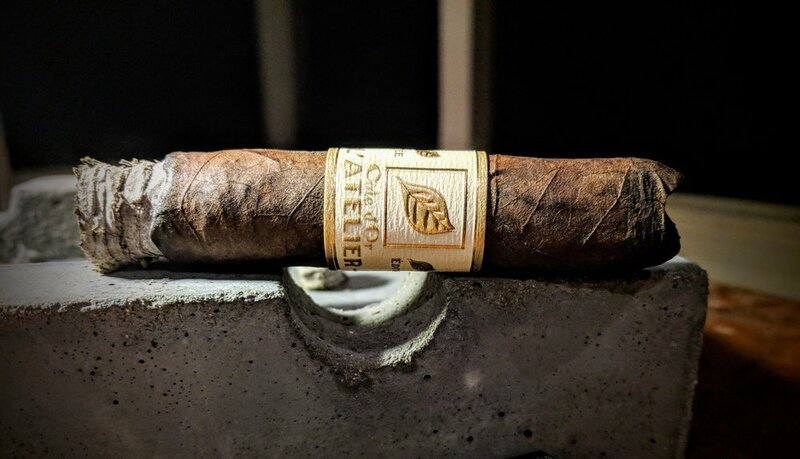 One of my long standing complaints with Ezra Zion's branding of cigars is that they fail to help people identify the cigar. It can be really hard to track down cigars from a trade or even year's later trying to remember which one had only an orange fabric band. Good on them for helping out those with bad memories like myself! 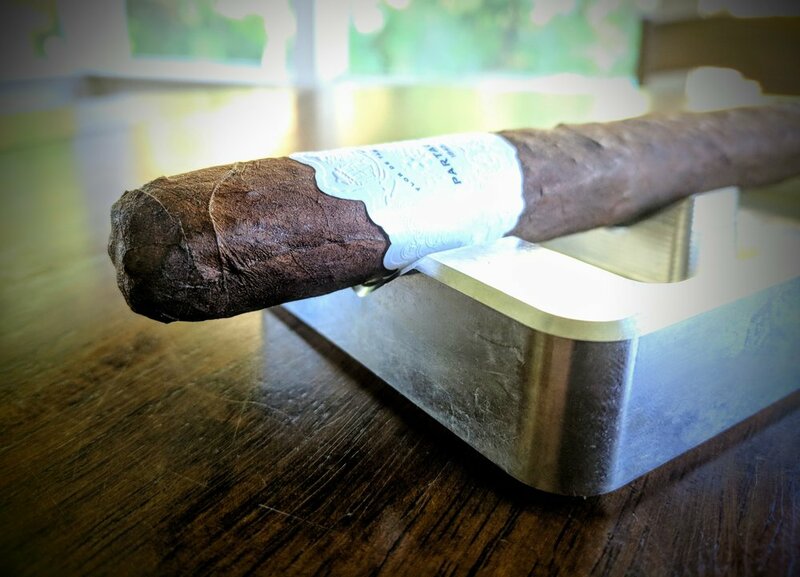 The (Pre)Eminence features a gorgeous, dark San Andres maduro wrapper. It's got a little knick in it but that's the only blemish that stands out. There are a couple prominent veins but the wrapper is essentially vein-free, or at least the dark color makes them more difficult to spot. The seams are nicely done and it has a nice oily sheen to it. 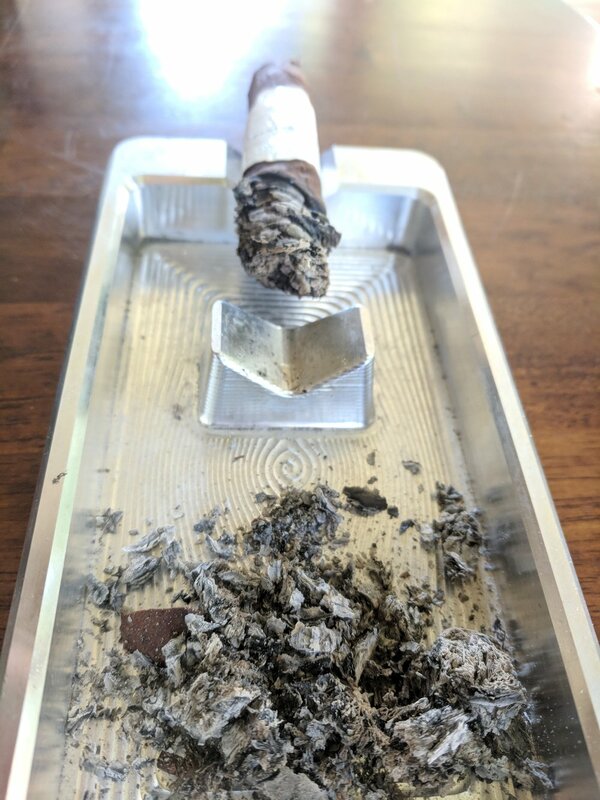 After lightly inspecting the cigar, I didn't turn up any inconsistencies below the wrapper. Everything is as it should be! The cigar has just a bit of give to it - more so on the firm side than spongy. The cap on this box-pressed churchill is a little sloppy. T he top has started to peel off slightly - not a huge problem, since I'll be slicing it off shortly anyway. The foot is well done and has all the trademarks of a well rolled cigar. 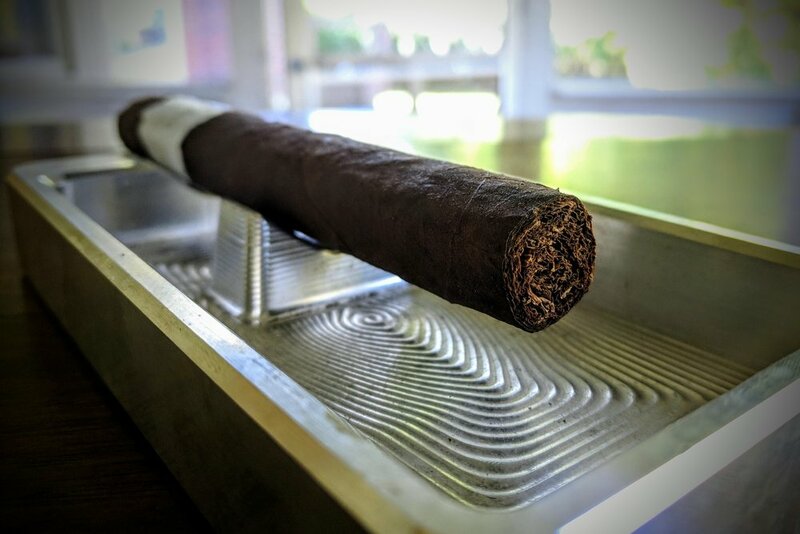 Overall, it's a good looking stick for maduro lovers. The foot conjures up some immediate chocolate, cinnamon and horchata - definitely smelling great to pair with coffee. The cold draw is light and quite sweet. This reminds me a lot of the milk after you eat a bowl of Lucky Charms. The draw itself is a little tight, but definitely workable. Toasted the foot, clipped the cap and we're lit! The first flavors to pop out are deep rich and chocolatey. There's a little spice on the tongue too - light but present. The draw is still a bit tight - hopefully it opens up as it burns. Speaking of the burn, the burn line has started with some waviness - nothing extreme and I think it will correct itself with time. The ash is quite dark - leaning more towards a graphite and medium gray color. Each puff of the (Pre)Eminence spews out a modest amount of white smoke. 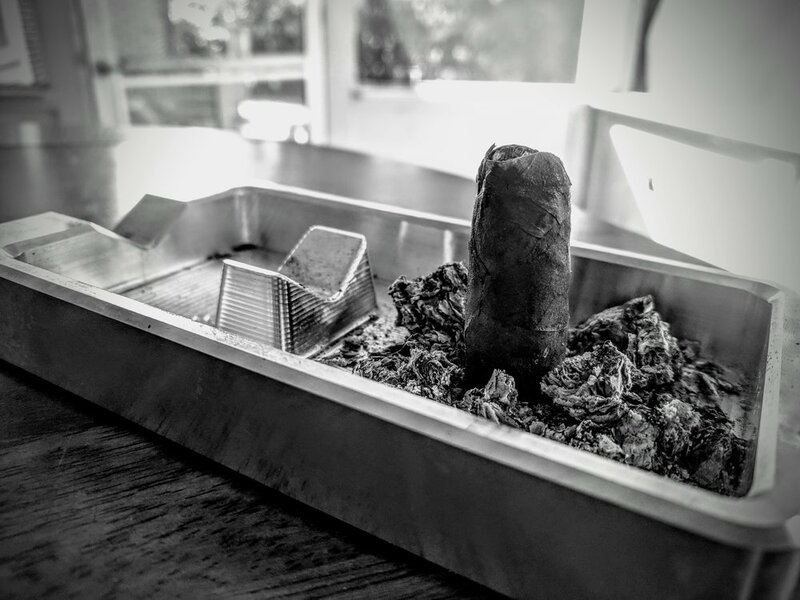 Resting, the cigar continues to have smoke trail from the tip. As I get into the first third in earnest, the peppery spiciness is in full swing. It's not distastefully peppery though, it brings to mind the pepper of a breakfast sausage patty. There is a little cream starting to develop but the chocolatey notes are nearly gone. The draw has improved and it's smoking with just a hair of resistance now. The burn line remains interesting. It's still uneven but, again, doesn't warrant correction at this point. The ash has actually lightened significantly. 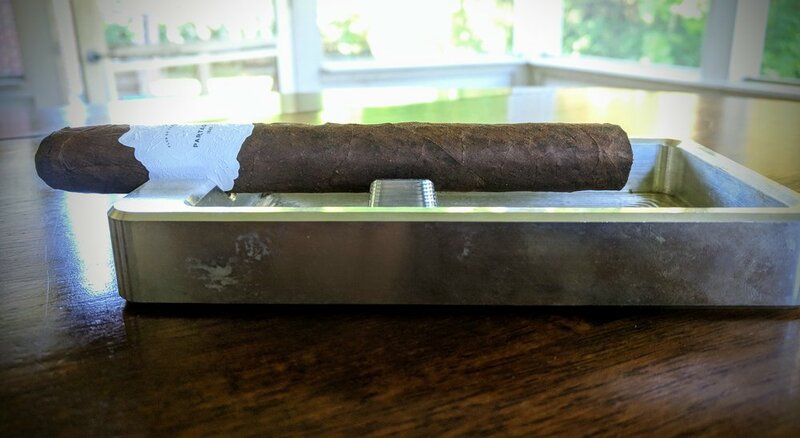 I feel like ash is typically the same color throughout a cigar, so we'll have to see how the (Pre)Eminence unfolds as I smoke it down. So far, this is pairing very well with my strong cup o' joe. The pepper matches well with the strength of the coffee. The cool burn of the churchill is great to match the heat of the coffee. The middle third continues the black pepper noted in the first third. There's a faint chocolate returning to the palate; it's more of a lingering notion rather than an overt chocolatey-ness. The cream is still present as well - very light. In no big surprise, the retrohale brings out the pepperiness but it is fairly smooth and not too harsh. The draw is just about perfect - zero complaints - it's really opened up nicely. The same can be said for the burn line - everything has evened out and it's burning beautifully - crisp, clean and razor-esque. The ash has reverted back to a slightly darker gray with just a hint of brown to it. It's been stacking well and ashing itself about about every inch. So - still pepper. It had started to fade a little bit but it's really been a consistent flavor throughout. I had hoped that the chocolate/cream that had started to develop in the middle third would build and swap out for the pepper, but no such luck. Again, the draw and burn have been flawless all smoke. Great performance indicating quality construction and leaves. The ash mosiac continues as the (Pre)Eminence has wavered back and forth from extremely dark to very white. 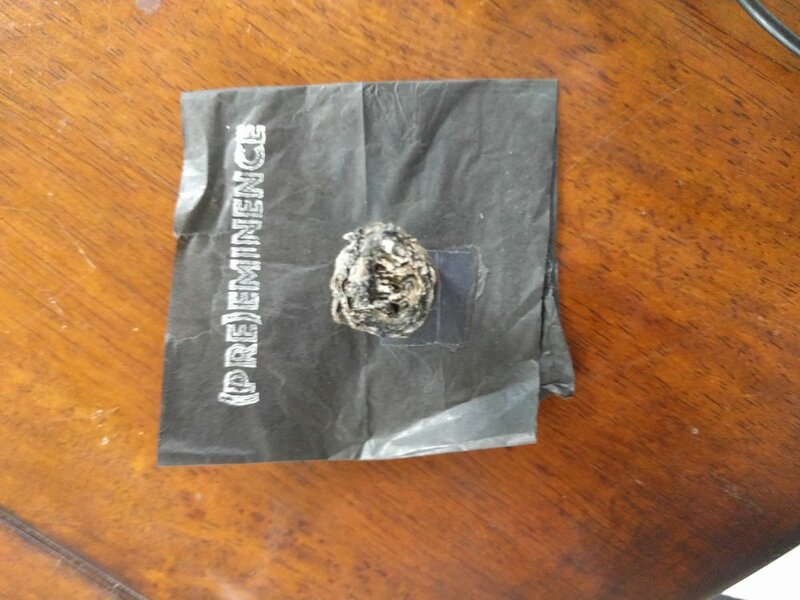 (Pre)Eminence was one note. The flavors start with pepper, introduce a little chocolate and cream and then the pepper continues to dominate. I had high hopes that the pepper would take a back seat at some point but that was never the case - black pepper through and through. The burn rate on the box-pressed churchill was perfect - never too fast or too slow. It burned cool down to the nub - which as mentioned, complimented the coffee paired with it nicely. 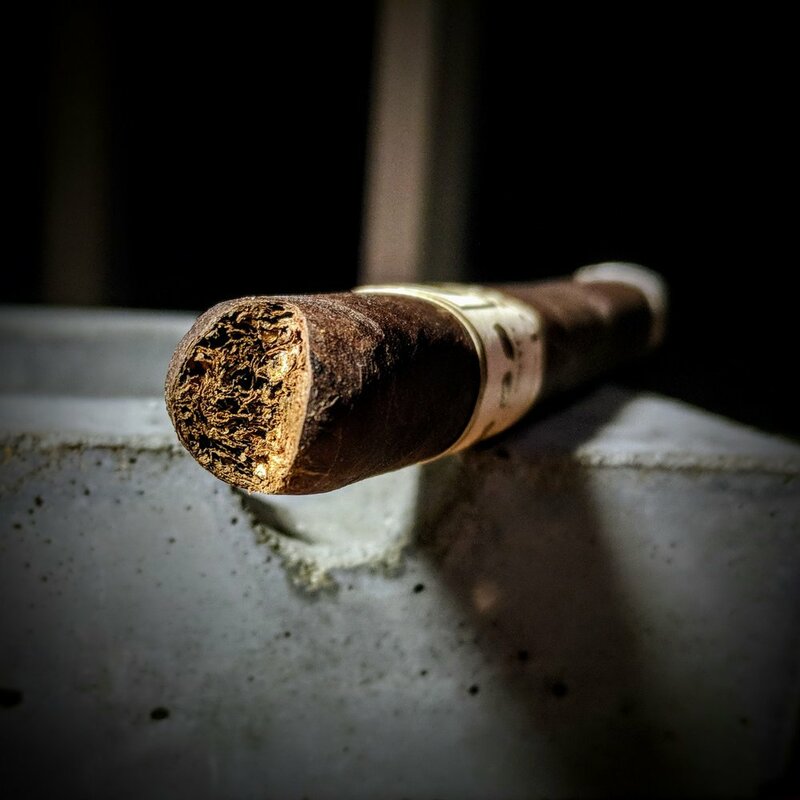 The cigar burned well and never required a relight or correction. While I did enjoy the (Pre)Eminence, it needed to progress more to really go into my normal rotation. Pairing with a nice, strong coffee was excellent. I wonder if this blend would be better showcased in a corona vitola, something a little quicker to smoke. 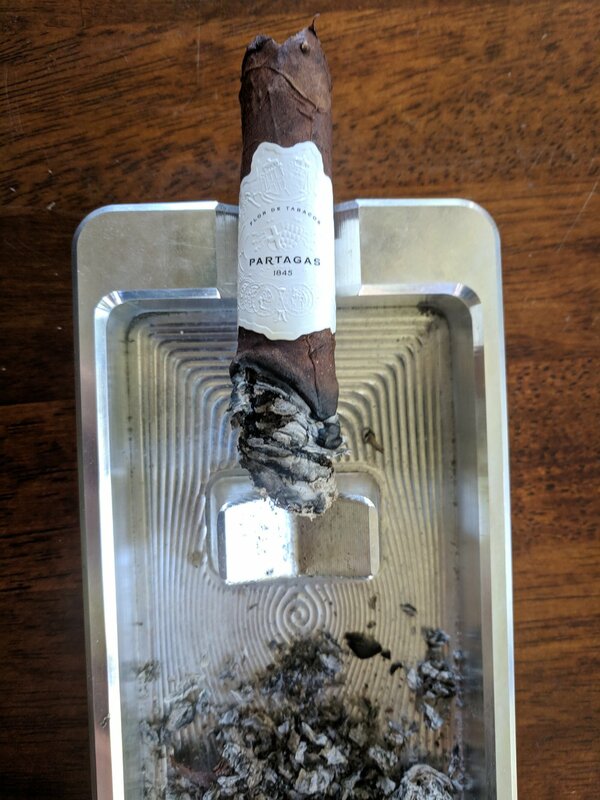 (Pre)Eminence was a good, solid early day cigar. 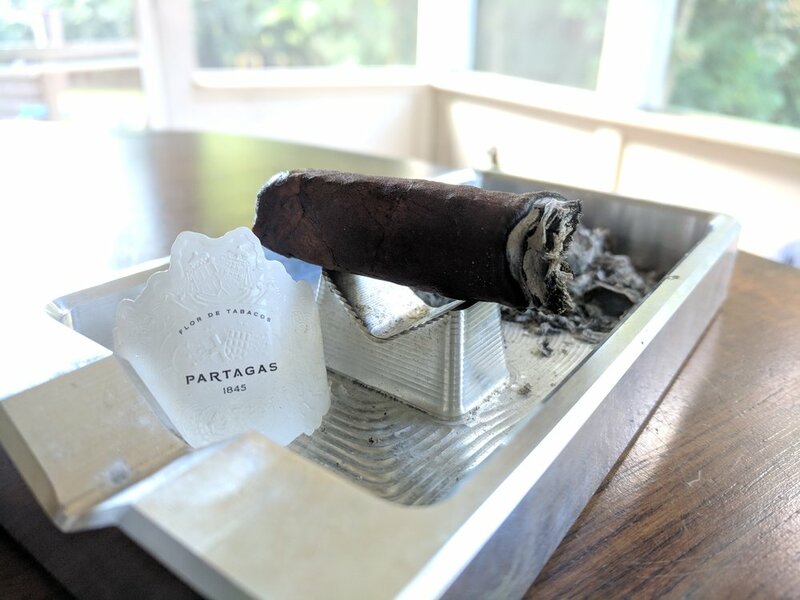 The breakfast sausage flavor paired superbly with coffee but as the experience continued, I was left wanting more variety and complexity from the cigar. If pepper is your thing, this is a great option as it's a well made cigar that showed no burn issues or real construction problems. 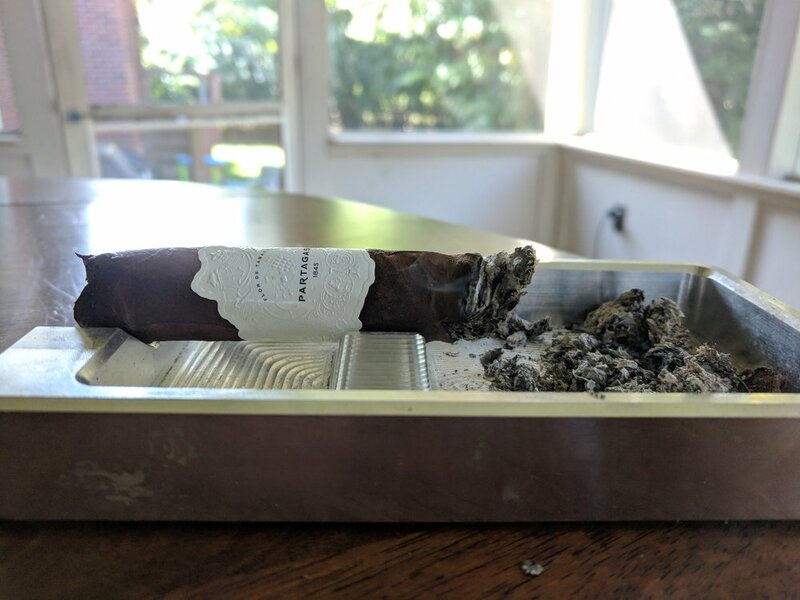 I love reading other reviewers' thoughts on the cigars I'm smoking and reviewing. 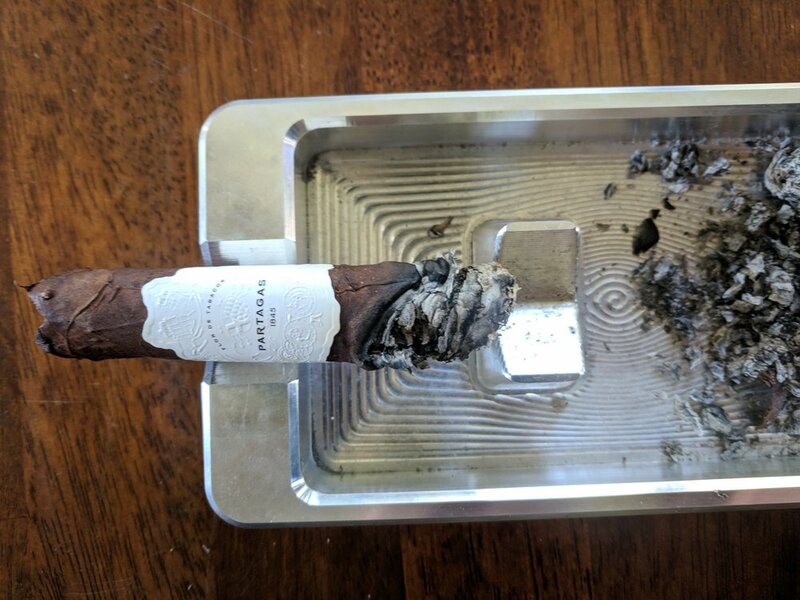 If someone else has review Ezra Zion's (Pre)Eminence, I couldn't track it down. Nothing out there to really compare to at this point. 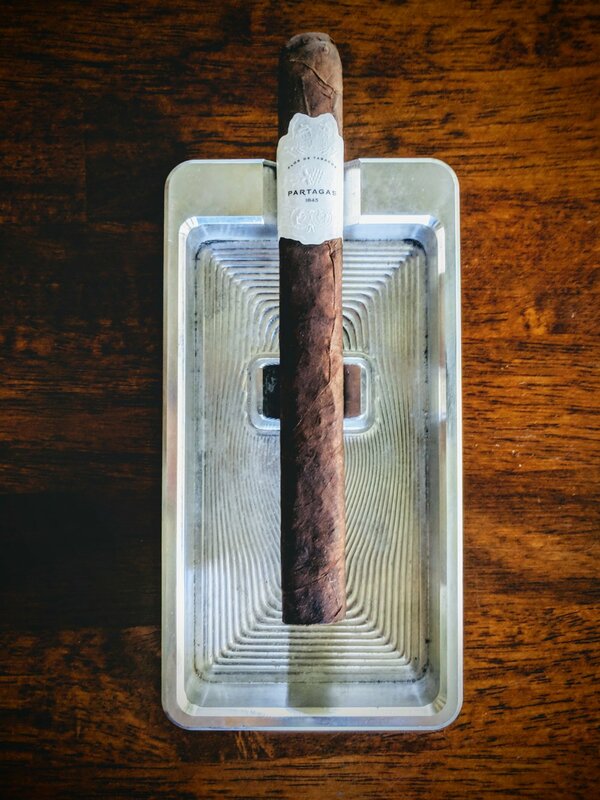 For those that don't know, L'Atelier is owned by Tatuaje founder/owner Pete Johnson. Leading up to the first Cote d'Or release in 2015, Johnson worked closely with the Garcia family to develop a phenomenal tobacco crop - Pelo de Oro. Pelo de Oro can be very hard to farm and use for production for a few reasons: (1) The soil environment that it's best suited to is hard to maintain, (2) the crop is typically more susceptible to mold and (3) it typically produces very low yields. Many avid cigar smokers may know that Pelo de Oro has been banned from the magic isle of Cuba due to its proclivity for mold growth. What the heck is Sancti Spiritus? Apparently it's a blend of criollo and the coveted Pelo de Oro tobacco. "Pelo de Oro" is Spanish for "golden hair". The tobacco itself is known for a trademark strength and mildly sweeter flavor. "Cote d'Or" is actually French for "Gold Coast". It's a reference to the French wine-growing region of Burgundy - mostly known for its world-renowned pinot noirs. The region can be very finicky to grown pinot grapes in so it is a fitting name for the notoriously difficult to work with Pelo de Oro tobacco produced under the French import label. The Cote d'Or was rolled in a churchill vitola the first year and third year with a robusto sandwiched in for the sophomore year. The 2017 edition reverted back to the 2015 in terms of vitola and blend. 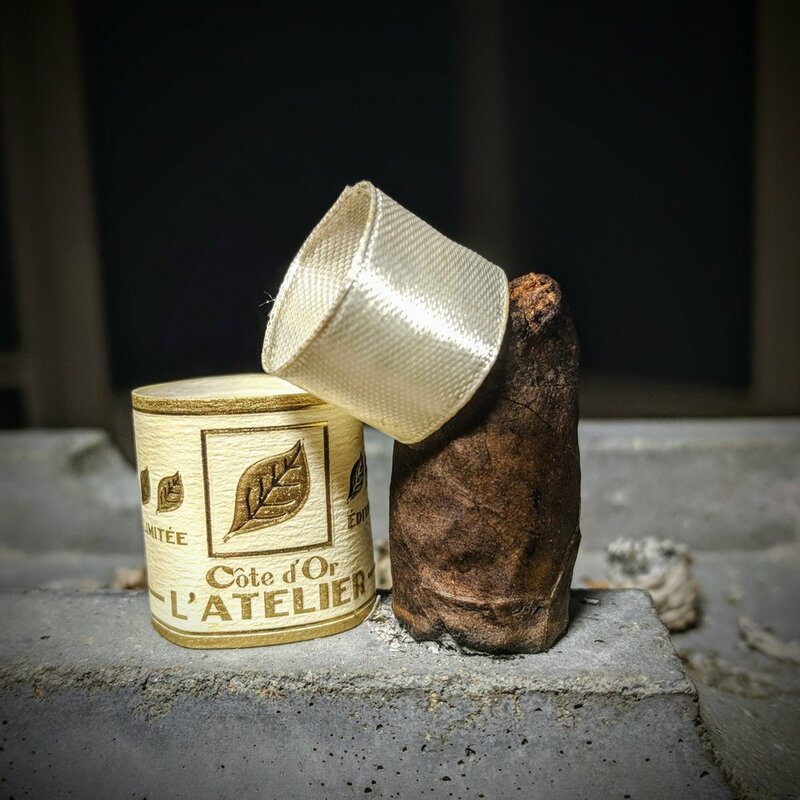 The bands found on L'Atelier's Cote d'Or ooze the elegance you'd expect from a fairly spendy limited release cigar. The foot is dressed up with a white gold colored satin band. I always appreciate the attention to detail and consideration that goes into deciding when a cigar merits a satin foot band. The primary band is located at the traditional position closer to the cap. It is a simply designed off-white or cream-colored band accented by gold leaf for all the text and graphics. 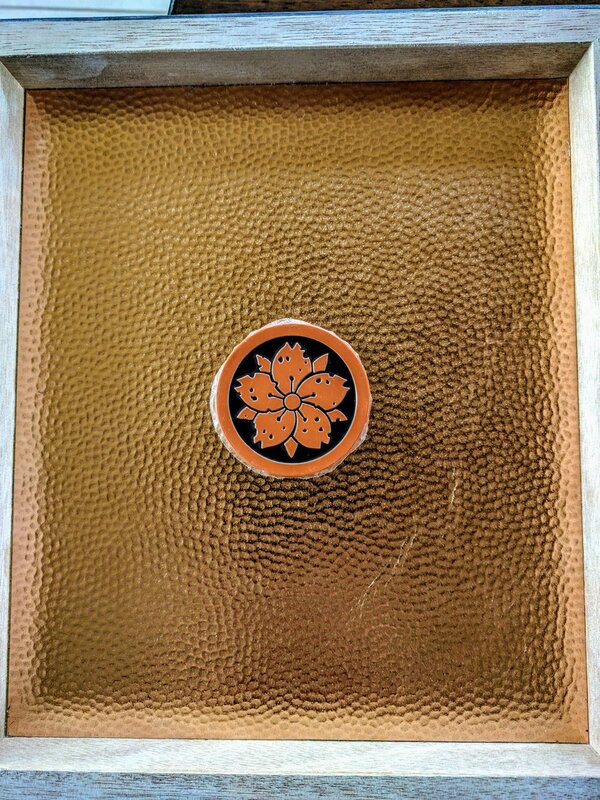 The graphics are simple - a boxed in gold leaf - found on all L'Atelier's non-Surrogates lines. The paper used for the band feels rich and thick - similar to something you'd print business cards or a wedding invitation on. The brand name and special blend are noted on the bottom of the band and a small series of numbers on the back indicate the year of release. 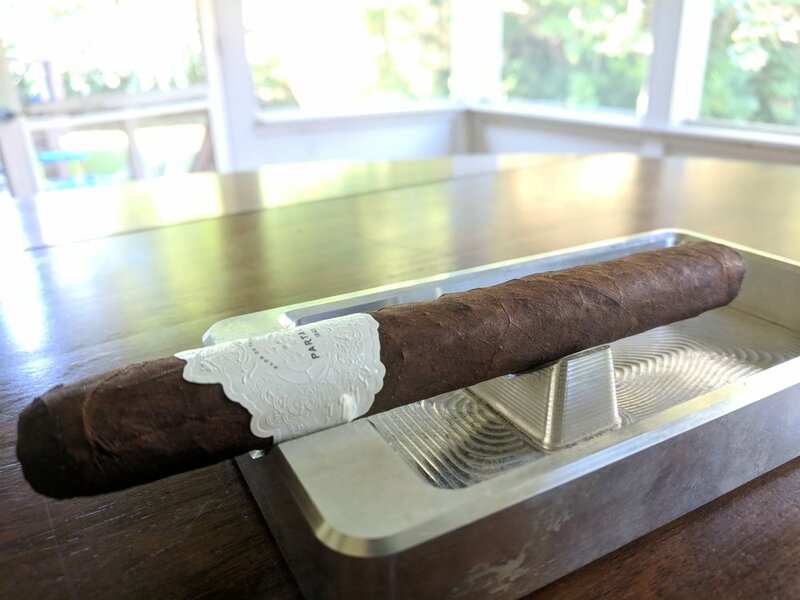 The release year is an amazing detail for those like me who are notorious for forgetting to label their cigars with the date purchased - especially useful since the designs of the 2015 and 2017 bands is very similar, if not identical. 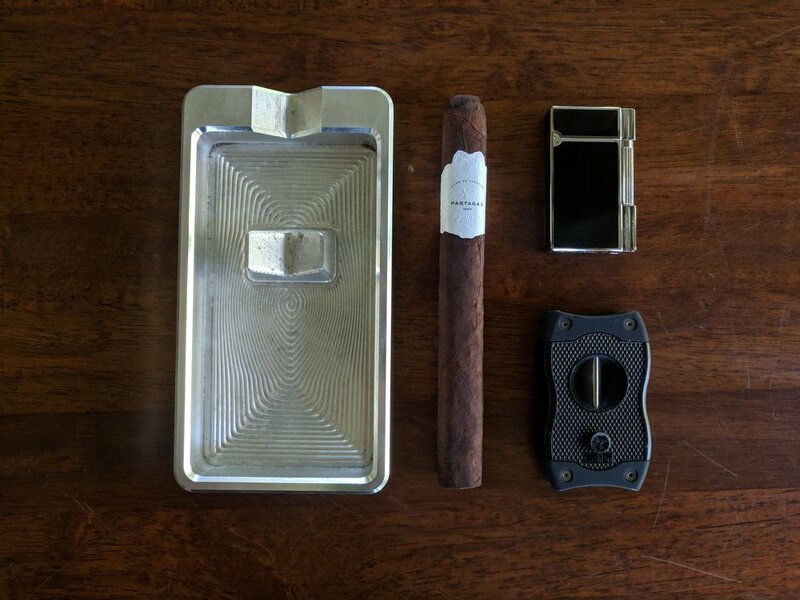 While muted and easy to glance over, I appreciate the band design and feel it's very appropriate to the cigar's format, theme and overall line design. 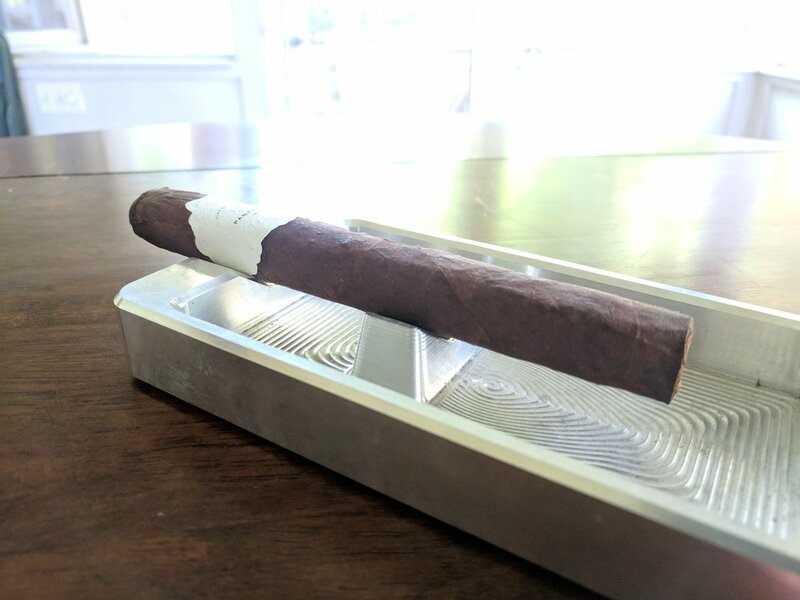 L'Atelier's third iteration of their limited edition Cote d'Or annual release is wrapped in an absolutely gorgeous dark, chocolate Ecuadorian Sancti Spiritus leaf. The Sancti Spiritus wrapper is also used on L'Atelier's Selection Speciale releases. It's usually a darker priming leaf which brings more complex flavoring. 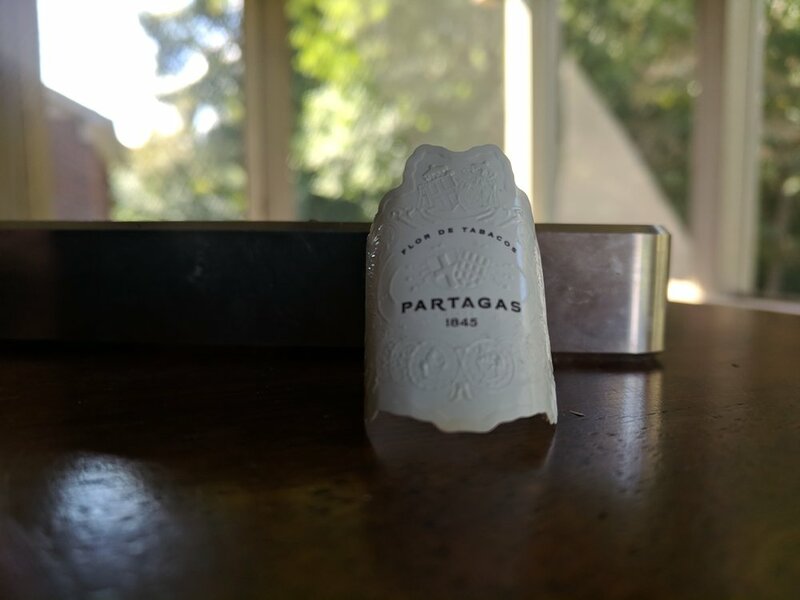 The wrapper is relatively matte in finish with several veins spanning the entire length or body of the cigar. The seams are obvious from the color variation but sit very flat and smooth overall. 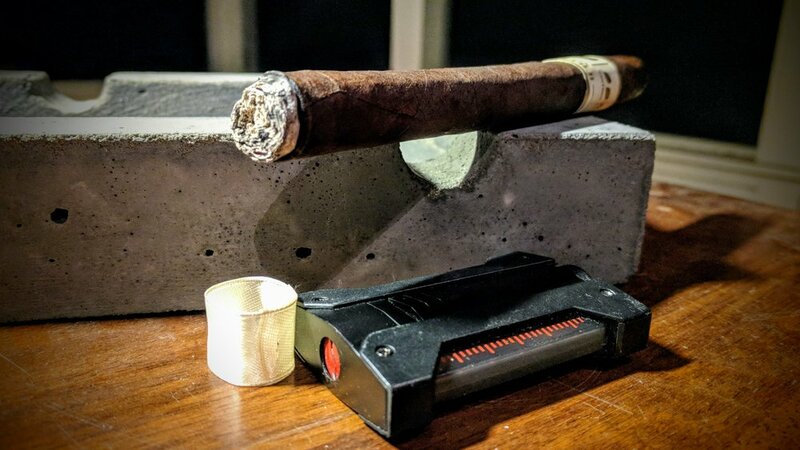 The cigar itself is fairly light to hold - which for a big ol' churchill is unexpected. Maybe it's the lightly designed band playing tricks on my brain but for a churchill, the Cote d'Or really feels dainty. The cap is flawlessly applied. The shoulders fall deep into the body and there is virtually no distinction to indicate a border between the cap and the wrapper. The foot appears to showcase a well-packed cigar with some decent color variation throughout. There are a couple chunks but I'm hoping they won't present any issues. 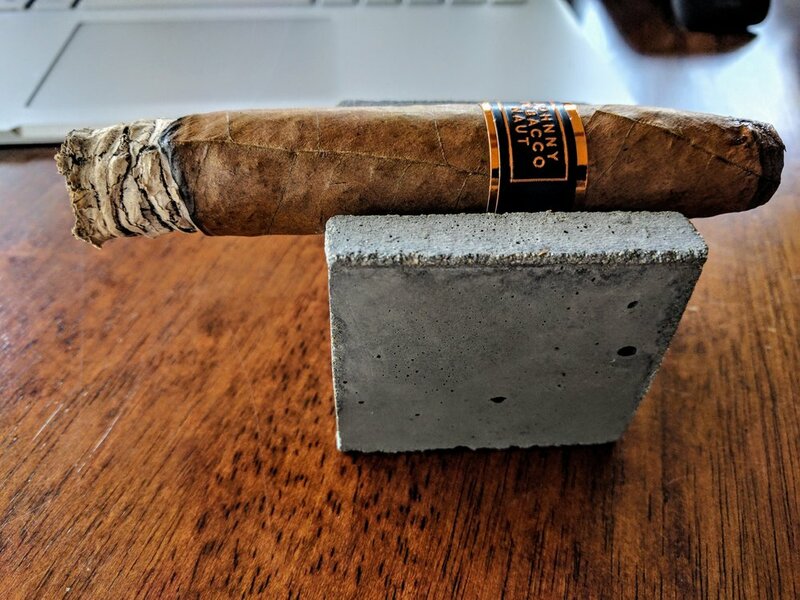 Usually the vitola or shape of a cigar doesn't warrant much critique or praise. However, in the case of the 2017 Cote d'Or, it's really a beautifully rolled cigar. It uses a very nicely executed soft box-press that I can appreciate for a number of reasons. 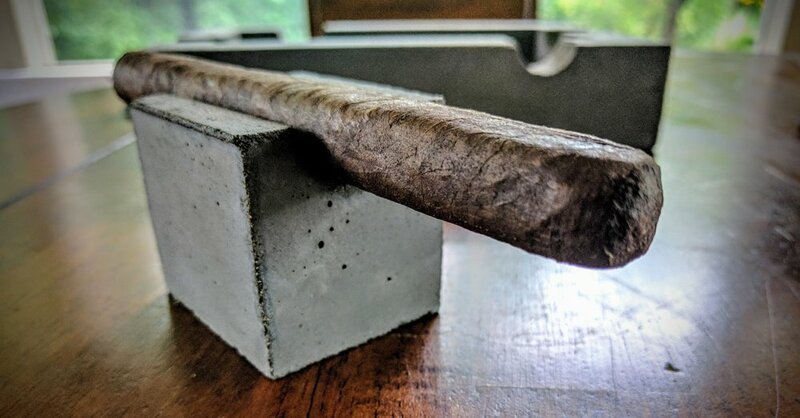 Sometimes box-pressed cigars can be sloppy to cut and the caps can easily get mutilated. 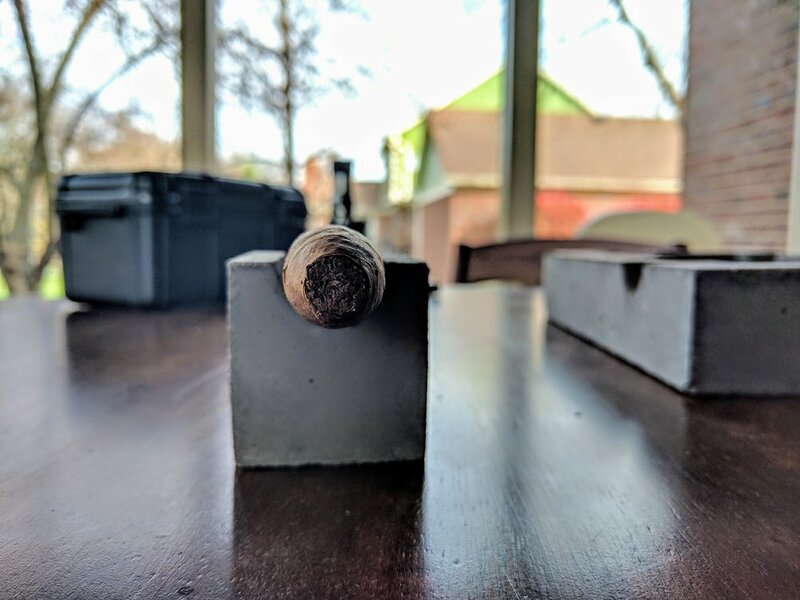 The method of applying the triple cap on this stogie is masterfully done - everything snipped easily and perfectly. 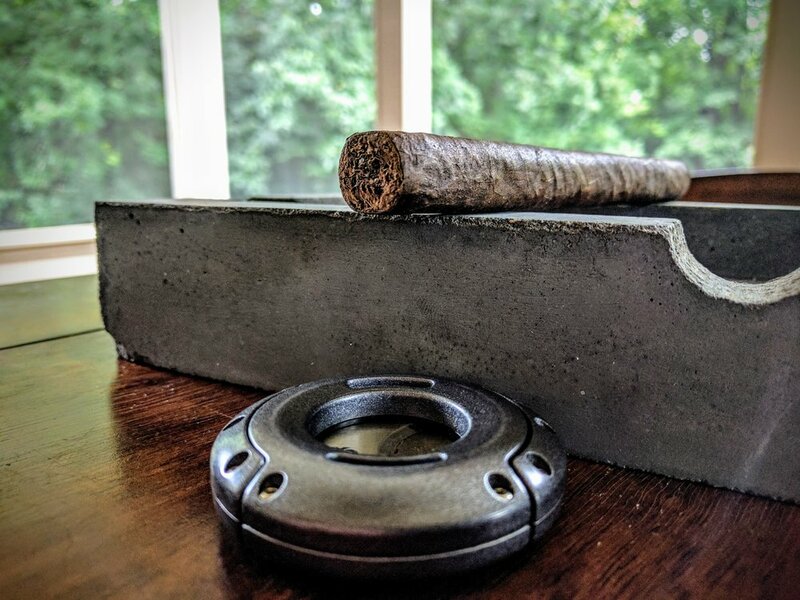 The other main reason I love this shape is trivial - but when resting you definitely don't need to worry about it rolling off the table or out of the ashtray - which is a relief for a spendy stogie like this one. It also just feels 'right' in your hand - no better way to say it. There really isn't much on the nose - either from the foot or wrapper. If I had to pick a particular aroma that stood out - it would be tobacco, graham cracker and cedar. The cold draw is open and brings about some cedar, white pepper, and classic mild tobacco flavors. The Cote d'Or lights up perfectly and evenly. The first couple flavors to pop onto the palate are a light peppery harshness and some cinnamon-y baking spices. All in all, a lighter-bodied start to the stogie. The draw is open and offers not much resistance but still an acceptable level. No real complaints to be made about the draw. The burn is starting out magnificiently - even, clean and sharp. The ash is very light gray - bordering on white. The smoke output on the Cote d'Or is definitely on the lower side. 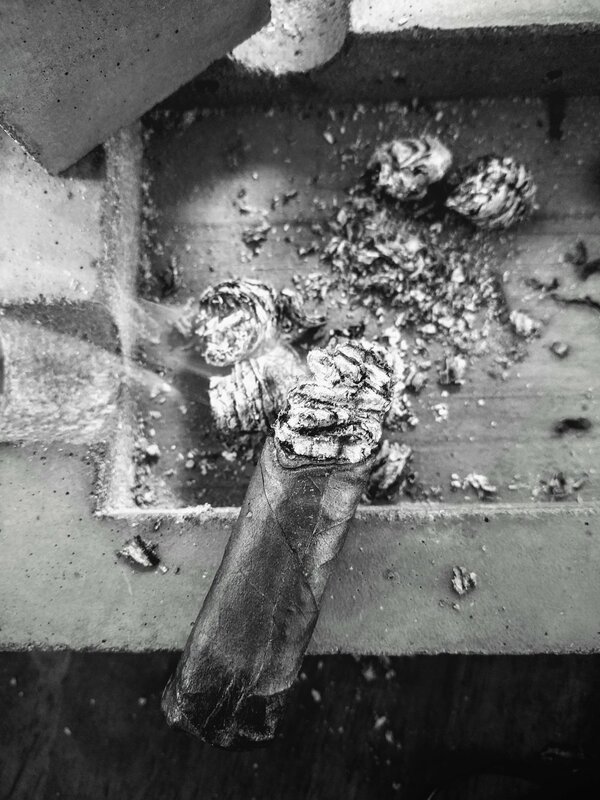 A soft trail of light, white smoke gently flows from the cigar while resting. 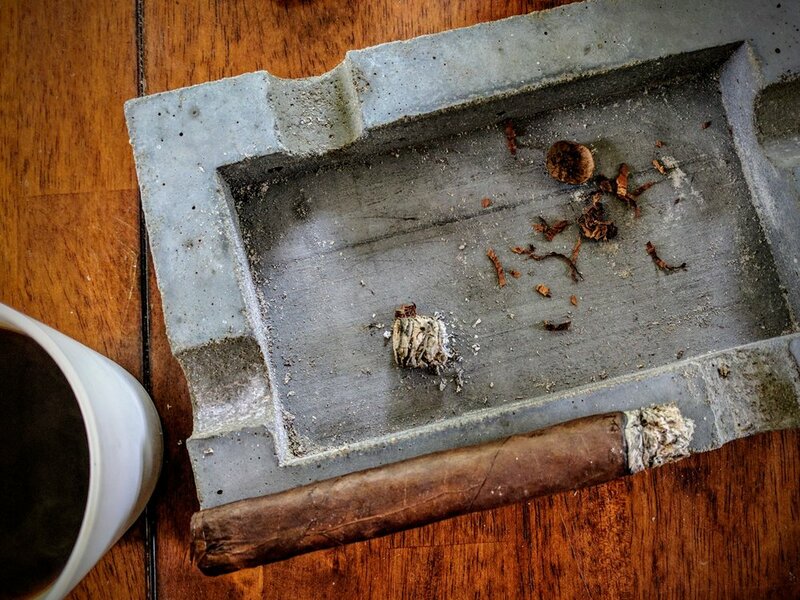 When puffing, the stogie churns out a very pleasant volume of distinct smelling white smoke. It is a lighter smelling cigar that I found to smell fantastic throughout the smoke. Any harshness or pepper found on the first few puffs have disappeared as the first third gets burning in earnest. The flavors still carry a little zing to them but, to me, it's not a pepper or spice necessarily - it's more of a citrus-y zest with some baking spice. It's very soft too - definitely not overly spicy or dominant on the palate. There's some faint cedar and just a little light cocoa that sit in your mouth between puffs. The draw continues to be open but enjoyable - certainly not the usual milkshake consistency typically sought after but by no means too open or loose. The burn is impressively sharp. There are almost no real deviations or trouble spots behind the nearly inch and a half long ash that has built up. Things are off to a great start with the Cote d'Or. The zesty zing of the first third definitely continues as the second third kicks off. I still don't get much pepper from the flavors - which have been prominently noted throughout other reviews. For me, it continues to be citrus zest and baking spices that lead the flavors on the palate. The profile is developing though and bringing some additional earthier notes as well as some bread/dough. Wood (maybe still cedar?) play more of a role and is paired with some creamy earthiness. There's also a bit of lingering sweetness going on - imagine tea with honey and a heavy dose of lemon. Still no issues to report on the draw or burn - both are executing at very high levels so far. The ash is consistently building to about an inch or slightly more prior to dropping. It's a dense white ash that doesn't give much cause for concern about it randomly dropping on your lap. The lemony sweetness paired with the subtle baking spice is still a dominant force on the palate and it really is unbelievably great. The flavors so far haven't departed much from those primary notes and, honestly, I'm just fine with it. It continues to be complimented by random spurts of cedar and light cocoa/chocolate - but, again, I'm fine to do without those additional flavors at all. One more addition to the palate that has crept in is a roasted nuttiness. The herbal, spicy, lemon/honey at the forefront - especially now that they've truly built on the palate - are phenomenal. 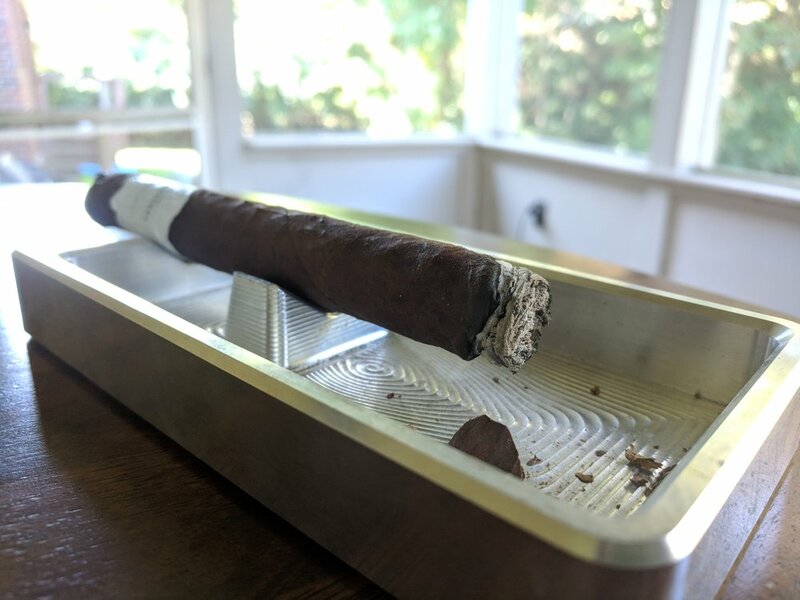 While L'Atelier's Cote d'Or never diverts too much from the citrus zest and baking spice flavor profile I've noted throughout the review, it does an awesome job building on those flavors to offer a seemingly simple but ultimately rich and complex experience. By the end, I really wanted to grab a cup of tea to compliment the smoke perfectly. 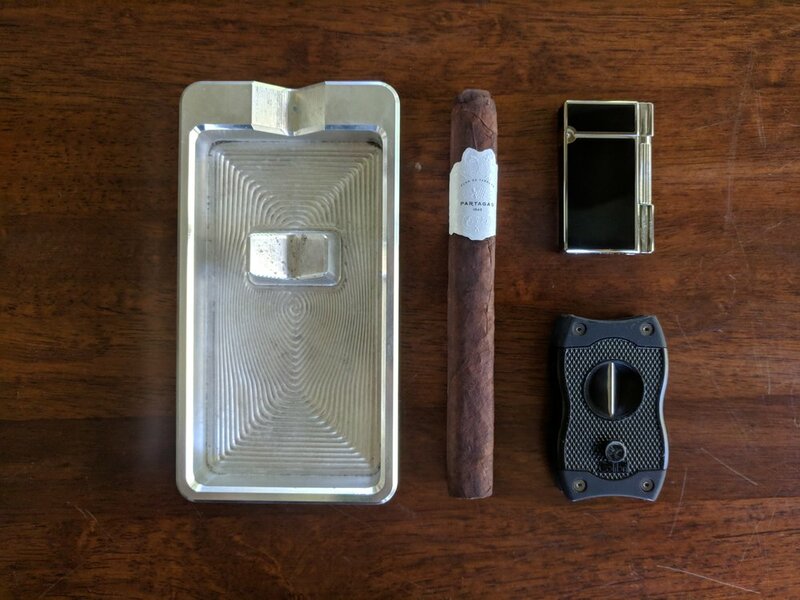 This cigar is definitely not a three-course meal but sometimes it's best to hone in on what you want to do and do it well. The Cote d'Or excels in this field. It doesn't try to be what it's not, it sticks to a few truly great flavors and seeks to develop them. If you did a word search on this review I probably used the word "perfect" too much. It really sums up the experience. The draw, burn, burn line and ash left literally nothing to be desired - a fantastic smoke from light up to nub. I'll admit that I am not overly familiar with L'Atelier's full line of cigars but man, I will be digging into their line more! The Cote d'Or was a superb introduction for me. It really impressed with what I'll call a simple complexity and flawless construction/burn. The flavors were truly a unique experience and continued to build and captivate me throughout. The burn itself never needed correction or gave cause for alarm. Not that I need more to watch for, but the annual release of Cote d'Or is definitely on my radar now. At $16 MSRP, it's a spendy stick for sure but certainly a worthy selection for any occasion. 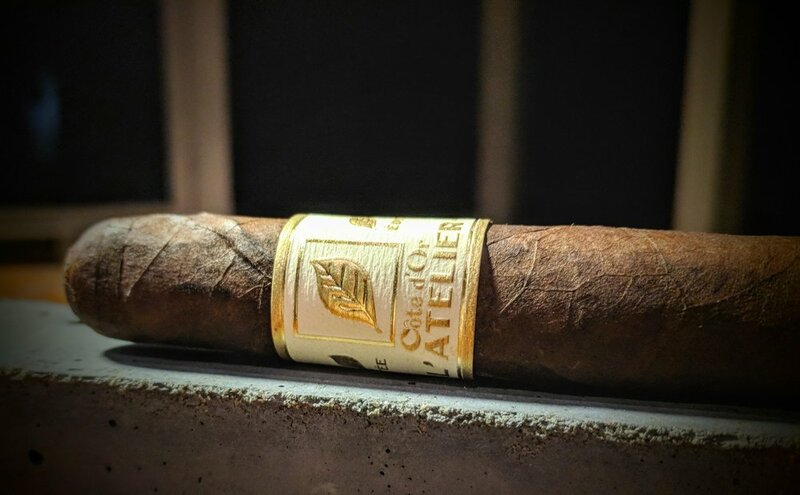 The L'Atelier Cote d'Or 2017 is easily one of the highest rated cigars I've had the joy to review. Outside reviews of it were mixed but universally praised the cigar. As you can see, the range of ratings is minimal and generally average out (9.2) close to my Burn1 rating. It's always interesting to see how other reviewers notes differ/align with my own. In this instance, it seems we aligned more than differed.